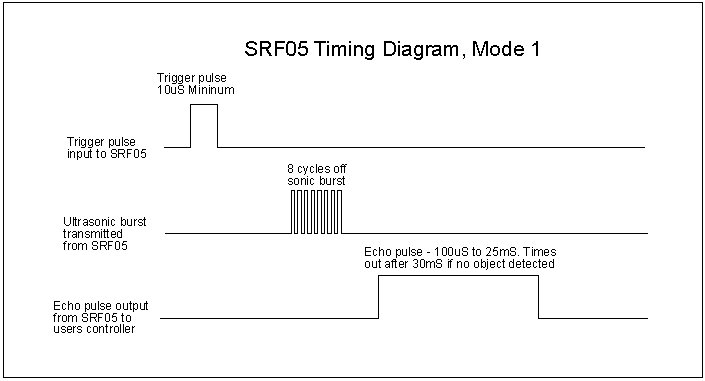 The SRF05 Timing diagrams are shown above for each mode. 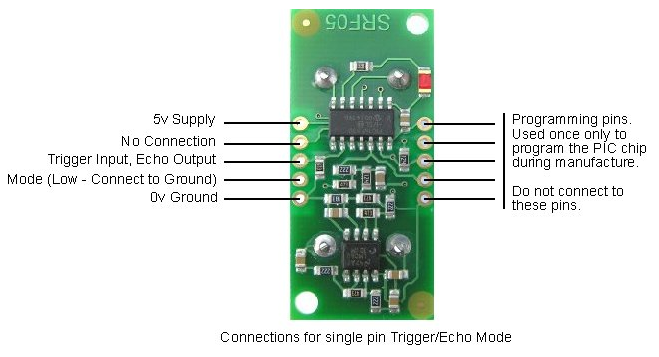 You only need to supply a short 10uS pulse to the trigger input to start the ranging. The SRF05 will send out an 8 cycle burst of ultrasound at 40khz and raise its echo line high (or trigger line in mode 2). 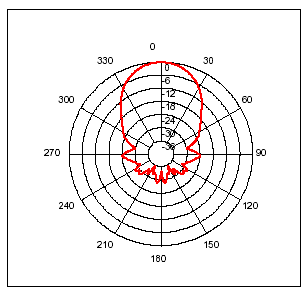 It then listens for an echo, and as soon as it detects one it lowers the echo line again. The echo line is therefore a pulse whose width is proportional to the distance to the object. By timing the pulse it is possible to calculate the range in inches/centimeters or anything else. If nothing is detected then the SRF05 will lower its echo line anyway after about 30mS. The SRF04 provides an echo pulse proportional to distance. If the width of the pulse is measured in uS, then dividing by 58 will give you the distance in cm, or dividing by 148 will give the distance in inches. uS/58=cm or uS/148=inches. The SRF05 can be triggered as fast as every 50mS, or 20 times each second. You should wait 50ms before the next trigger, even if the SRF05 detects a close object and the echo pulse is shorter. This is to ensure the ultrasonic "beep" has faded away and will not cause a false echo on the next ranging. 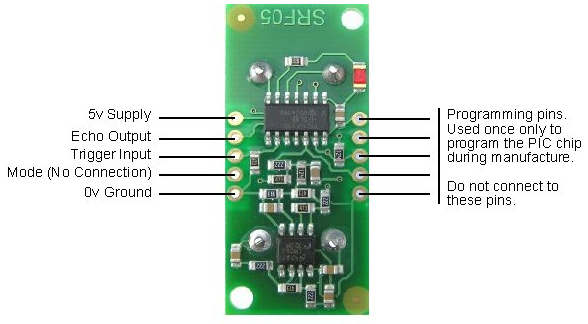 Get SRF05 Ultrasonic sensor (SKU:SEN0006) from DFRobot Store or DFRobot Distributor.